A week long day camp geared to develop and improve campers’ individual basketball skills. This includes passing drills and races, lay-up lines and competitions, as well as basketball centered games and other activities. The camp is open to all ability levels and will provide a positive and fun teaching environment for all campers. Each day will include small-group skill instruction from Penn staff and players as well as some other high school and college coaches from the area. Campers will also play full court 5-on-5 against other campers in their age groups. Camp dismissal is at 3pm, Monday through Thursday. Check in for all campers is between 8:30am - 9am at the back of The Palestra. Checkout is Thursday at 3p.m. after a brief award ceremony. Campers only will be released to authorized adults. LUNCH: Campers must bring their own lunch. We will have a canteen that sells water, Gatorade, and candy. 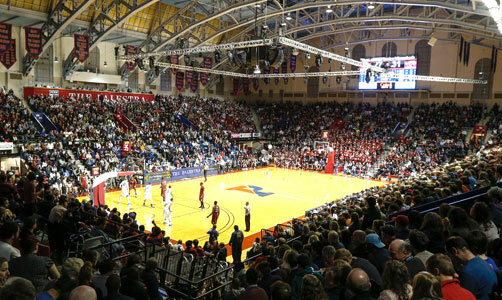 University of Pennsylvania faculty and staff are eligible for a $25 discount. For the promo code, contact Joe Mihalich at jmih@upenn.edu. If cancellation is received by June 1st, all but $100 of camp fee will be returned. Any cancellation after June 1st will result in forfeiture of entire camp fee.